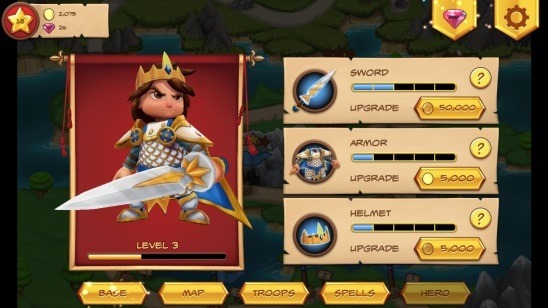 Royal Revolt is a free reverse tower defense game for Windows 8. In this game you play as the young prince who has been thrown out of his kingdom while he is in Bogsmartz (a boarding school, away from his kingdom for spoiled and aristocrat youths), learning Magic. After the death of his father, his evil aunt and uncles kick him out of his kingdom and split the kingdom among themselves. Now with the help of your trustworthy soldiers, you have to strategize and lead them to victory against the greedy relatives by concurring all 58 Castles, and regaining your rightful kingdom. The relatives, in return will try to stop you by sending their own troops to fight you and set series of villainous traps. You have to eliminate the troops, win over the traps and bring the castles down. The Royal Revolt Game app is present under the Games Category in Windows Store. 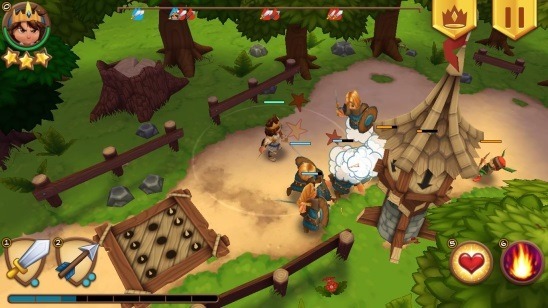 As mentioned Royal Revolt is a Reverse Tower Defense medieval period game. The scenario in usual Tower Defense game is that you have to defend your towers/castles from getting concurred by stopping the oncoming gang of enemies from building traps and sending soldiers to fight them. But royal Revolt is complete opposite of that, here you’ll get to play as the leader of the oncoming horde. The game is a strategy game, but it is not complex at all! You have to make multiple easy strategies and decisions in between the game such as when to attack, what mix of troops will be good, when to use spells, and when to fallback for backup troops etc. You can build an army of archers, infantry, siege weapons, and wizards, and then lead them for fight. Navigating the hero is very easy, all you have to do is click on the desired place where you want him to go, your troop always marches forward. You can use different spells that you have learned in the magic school in between the game. This helps in defeating your enemies quickly. Some of the spells that you can use are: heal, firestorm, hammer strike, avalanche, sonic blast, and many more. Plus you can also upgrade yours and your troops levels. All the upgrades and spells are unlockable and gets unlocked as you advance in the game. The levels difficulty increases as the level progresses. At the end of each level you you’ll get up to three stars (depending on how quickly you finish the level) and golds and gems. These golds and gems are used to upgrade you, your troops, and to unlock spells. Beside the difficulty and game play, the app has a really good and lightweight 3D graphics. The characters are made very cute and they are animated very well. And also, after every fight the prince, weapons, and troops dance at their victory! Free Windows 8 game app. Reverse tower defense strategy game. Use spells during the gameplay. Upgrade hero, spells, and troops. Royal Revolt is a fun game to play. Everything is in sync. 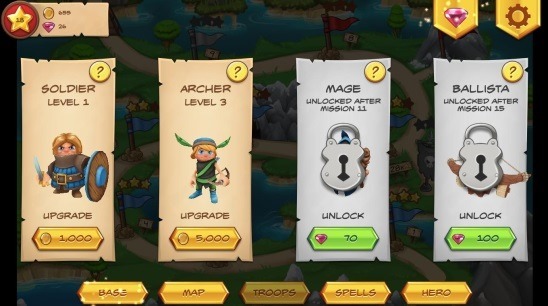 I would advise to generate more soldiers as compared to archers or others because the soldiers get generated more quicker, and to spend earned coins on unlocking spells and upgrading the hero, as these two are very essential. 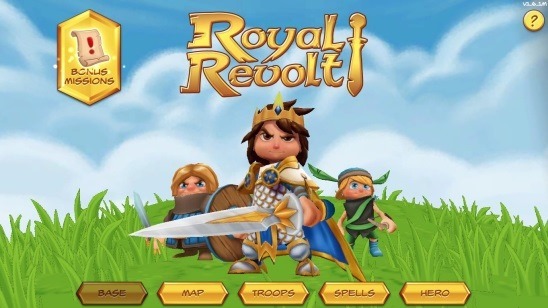 Royal Revolt is a very well made and entertaining, definitely worth a try!